Unfortunately, basement floods are something that every homeowner will need to deal with at one point or another. Whether it’s a mild case of moisture seeping in through the walls or a full-blown flood with knee-deep water, basement floods are inconvenient, unwelcome and can be pricey to repair. 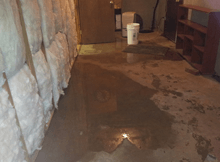 If you find yourself in the unfortunate situation of dealing with a basement flood then there are a few steps to follow, which will help get the situation under control. 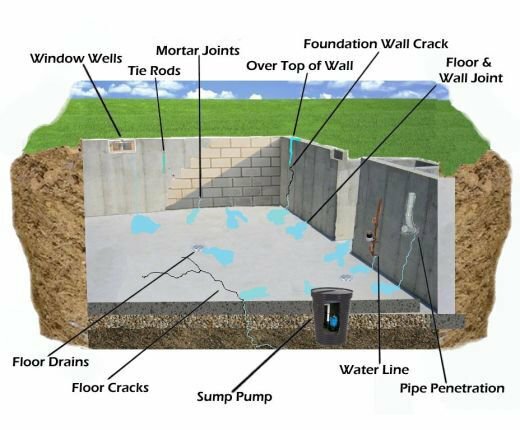 Apart from calling Triad Basement Waterproofing to help you deal with a basement flood, here’s a few tips on what you can do to get your home back to its original dry, warm and comfortable state. If you live in an area that is prone to heavy rains or heavy snow melts, check your basement often for standing water or unexpected moisture. The sooner you catch a leak, the easier it will be to control and your home won’t suffer extensive damage. Be aware of basement flooding warning signs so you know what to look for. It’s important to act as soon as possible after discovering a flooded basement. Check the area for live electricity. You should be aware of what currents are running directly through your basement and if there is electricity running through the flooded area then shut off the fuse to that part of the house. Never stand in water while touching something that has a live electrical current running through it. It should be pretty obvious where the water is coming from. It may be coming in through a window, through the floor seams, a crack in the wall or through the floor. If you can catch the water in a bucket or deflect it somehow try to do that before you start cleaning up. Otherwise water will continue to make its way in while you are trying to mop up and dry off your basement. If there are any items on the floor that have already been damaged by the flood pick them up and dry them off as best you can. Hang rugs and carpeting to dry, towel off any other wet items and set them in an area with ventilation so they don’t catch mold or mildew. Create a clutter free area so you don’t have to work around multiple items. The best tools for removing a large amount of water from a flooded basement are a vacuum capable of sucking up water or a pool pump. If neither of these is available to you then a plain old bucket and dustpan will also work. If you are using a wet vacuum or a pool pump don’t drain the water back into your backyard but direct it into a sink or another drain. The same goes for the dustpan and bucket. Use the empty dustpan to scoop water into the bucket and dump the water down a drain. After you have scooped out the majority of the standing water in your basement it’s time to soak up any residual moisture. Use a mop and continuously wring out the mop into a bucket until you’re not getting much water out of it. The basement will still be wet, but the standing water should mostly be gone. The thing about concrete is that it’s porous, which means that even if you collect and mop up any water from flooding the floor is still retaining more water than you may think. Run fans in the room for a day or two until the concrete floor is completely dry. Your main concern after a flood is to prevent mold and mildew from forming. Mold is a huge health hazard and spraying a disinfectant is an important step to prevent it. Lysol is a good choice because it kills mildew and freshens up the area. Generously spray the floor and walls with a disinfecting spray for a day or two to make sure there is no mold growth after the flood. Towel dry any furniture that may have gotten wet from the flood and make sure to spray it with a disinfecting spray that kills mold and mildew. If any cloth furniture came in contact with the water and absorbed it, unfortunately you may have to toss them out unless you find someone to wash and re-upholster them. These are a couple of do-it-yourself tips that you can initially take to quickly dry off and disinfect your basement after a flood. After you have secured the area contact the experts at Triad so we can come in and fix the leak so you don’t have to deal with any future floods. We offer services ranging from concrete and crack repair to basement waterproofing so future basement issues can be avoided! Are your concrete surfaces looking old, worn or dirty? Whether you have concrete surfaces indoors or outdoors that are in need of refreshing, the look of dull concrete can affect the overall aesthetics of any home and irritate homeowners to no end. Many people will decide to rip out the concrete and have it completely redone from start to finish, or they will buy concrete mix and try to pour it on top of the old surface. The first option of starting fresh is not a bad idea, but it is completely unnecessary. The second option of pouring new concrete on top of old concrete is a very bad one. This doesn’t work as well as you would expect it to, because concrete does not contain bonding agents and it will not adhere to the surface beneath it. This results in crumbling and an even bigger headache for the homeowner. This is where concrete resurfacing comes in. What is concrete resurfacing? Simply put it’s a thin cement based overlay with special bonding agents that is poured over existing concrete. Here’s a quick guide that will fill you in on all the benefits of concrete resurfacing. In comparison to other solutions that fix worn out and cracked concrete, resurfacing is very cost efficient. The overall cost can be up to three times less than ripping up and replacingold concrete. You save money on the cost of materials and labor while still achieving the look of a brand new surface. Concrete resurfacing can also be used to repair old surfaces as well as hide damage, so you get more for your money. Whether you need a garage floor, basement floor, patio, deck or pool coated, concrete resurfacing saves you time, money and it leaves your surface looking brand new! Resurfacing products are self-leveling, which means that there isn’t an extensive amount of work necessary to create a smooth and level surface. The main thing that needs to be done is to make sure that the resurfacing product is spread around the entire surface. Instead of spending time and money on trying to repair cracked concrete or ripping out an old surface and having it re-poured consider concrete resurfacing, which upgrades the look and hides any prior imperfections or cracks. Do you want a marble floor without paying the price of actual marble? Or maybe you prefer sandstone, brick, granite, or a specific color? The beauty of concrete resurfacing is that it can be tinted with special colorants or stamped with patterns or finishes. This allows you to customize your concrete floors and achieve the design and ambiance you’re specifically looking for without paying the price of the expensive materials. The materials used in concrete resurfacing are very durable and some can even be stain resistant. 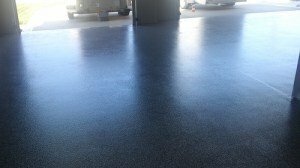 Triad’s heavy-duty epoxy-based systems not only upgrade the look of the floor you are resurfacing, but they also increase resiliency to stains, tire marks and hide minor imperfections. One of the best things about concrete resurfacing is that your new surface has the potential to last much longer than your existing concrete surface did. The benefits of concrete resurfacing go above and beyond the basic idea of upgrading a floor. It becomes an investment for the home, because it fixes cracked, damaged and worn out floors to make them look brand new while adding a customized design aspect, which in turn increases the value of the home. Concrete resurfacing is also often sealed and has the potential to last longer since it protects from daily wear and tear. You can even add non-slip coatings to your new floor so that it is safe to walk on regardless of how wet it gets. If you are considering fixing or replacing your concrete floors don’t rush into any final decisions before thoroughly researching all your options. Maybe tearing up your old concrete really is the best option, but chances are that concrete resurfacing will be able to repair and completely renovate your surfaces efficiently at a lower price. Triad offers a variety of colors and concrete coatings to choose from for your resurfacing needs and we also offer waterproofing for a completely dry and warm home. Contact us for a free estimate or for more information and check out our website to familiarize yourself with our other services! When fall and winter roll around they bring plenty of rain and snow along. When spring comes it brings warmer weather, which in turn leads to heavy snow melts and even more water outside your home. If your home’s foundation is faulty or if there are any cracks in your walls or the cement surrounding your home then there is a very good chance that the water on the outside of your home may end up inside. Finding a leak in your home is not fun. Finding a leak in your basement, where you may have stored valuables or renovated a new entertainment center, guest room or office is a nightmare. There are many different ways that water can find its way inside your home such as through the windows, wall cracks, the floor, seams between the wall and floor and even clogged rain gutters that can dump water against the foundation of your home increasing the likelihood of a leak. Water usually takes the path of least resistance, which means that it doesn’t have to force its way into your home, it finds its way in through a weak spot. Hydrostatic pressure is the real underlying cause of a leaky basement. This means that water continues to build up in the soil outside your basement walls and eventually when the concrete can’t hold it anymore it starts to crack and allows water to enter into your basement. A leak in your home will eventually lead to flooding if it’s not taken care of right away. Any kind of water in your home will ruin your floors, carpets, wallpapers, furniture and any other belongings you may have stored in the affected areas. All kinds of bacteria can make their way into your home through a leak, that’s why it is important to disinfect the affected areas as soon as possible after drying out a flooded basement. Moisture creates a breeding ground for mold and that can create very hazardous health issues for your house and your loved ones. Some types of mold, such as toxic black mold can start to grow immediately after a flood. The process of trying to dry out your basement after a flood or a leak will raise the humidity in the room and the air will become very damp. The humidity will also linger because basements usually have poor ventilation and little to no sunlight. This can also contribute to more mold growth. The combination of sitting water in an unventilated room and humidity will cause a very unpleasant odor to make its way through your home. Basement flooding can ultimately ruin the structure and foundation of your home, which in turn can lead to more cracks in the cement, more leaks and more flooding. A leaky basement has the potential to not only lessen the physical appeal of your home, but it can also depreciate its value. This can make it hard to sell your home if you ever want to move. It can also make it hard to qualify for flooding insurance if your basement is prone to flooding often. Any kind of moisture in your basement can ruin drywall, framing and any kind of wood. There are many other negative and dangerous side effects of a leaky basement. Homeowners put a lot of money into making their home a comfortable and aesthetically pleasing living space. Many also invest in turning their plain basement into an extra guest room, home theater, and office space or entertainment center. Imagine the heartache of all your hard work and spent money floating around in a pool of murky water after a heavy storm. Fortunately, there are solutions to leaky basements as well as preventive measures to help avoid unwanted water in your home and all the negative effects that accompany it. Many people will rush to their nearest home improvement store at the sign of a leak and spend money on sealants and waterproof coatings. While this may be a good temporary solution, by the time the next heavy rain fall rolls around the leak will be back. Triad Basement Waterproofing has more than 27 years of experience with leaky basements and helping homeowners repair damage to their homes after an unfortunate flood in the basement. If you are worried about a leaky basement and the effects it can have on your home or if you just want to be cautious then contact one of our representatives and we can discuss any services that you may be interested in!